The garden in 2012 saw a very strange year in terms of weather. To begin with it saw no real winter with many blooms still around in December of 2011 and only being killed off by light snow. Annual Rudbekias even survived the winter. There was also very little rain, and in general it was a dry winter which then led to a dry and very warm spring, droughts were announced across a large part of England during March and early April. As soon as hose pipe bans were in place in early April, the weather changed totally and for the next month and a half the garden was drowned under almost near constant rain. This meant my seeds were totally unsuccessful because I had to keep them indoors due to cold, grey weather and late frosts. My Cosmos all failed, Sweet peas barely made it, and Peas, well; let’s say none ever developed. I guess you could say that the garden resembling a jungle was one good outcome after the rain? Late may saw 2 weeks of very hot, dry weather at last and a mini heat wave, which of course gave way to more of the same wet, cool weather. It wouldn’t have been so bad if it was warm and wet, at least then things would grow better. 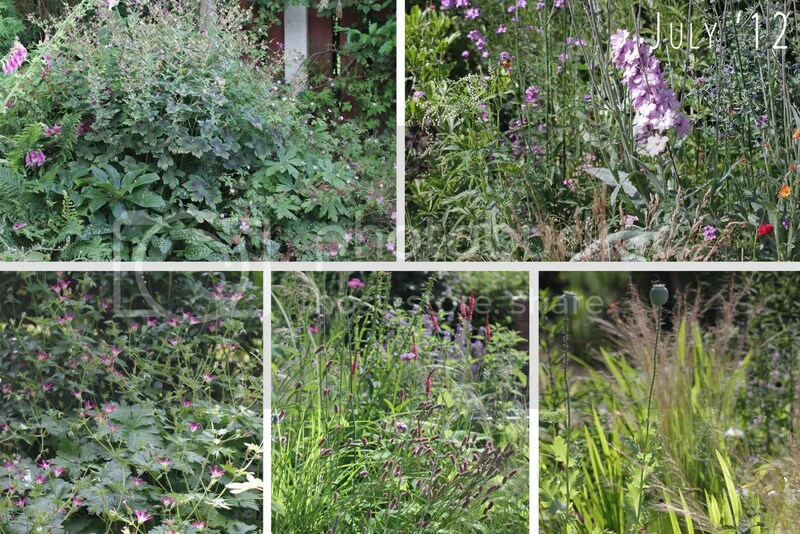 In early June I began the final extension of my ‘right’ border. 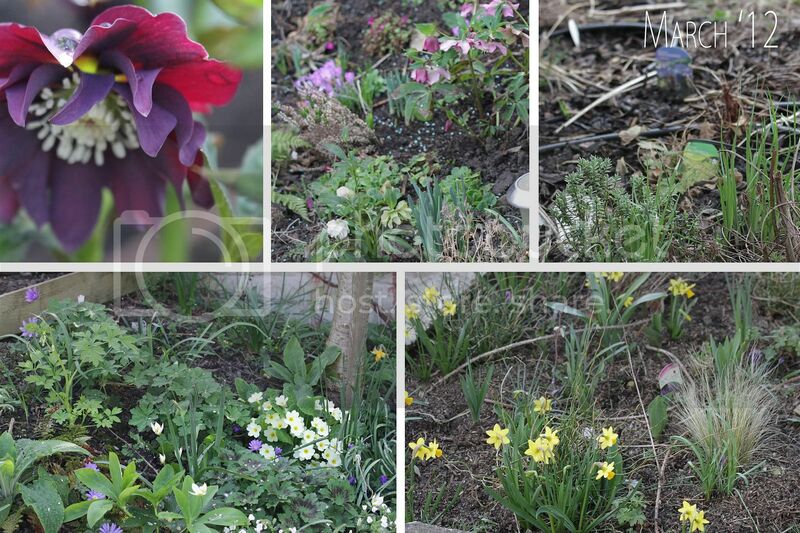 Over the years I have gradually extended it up a slope in the garden. The idea is that I don’t have to mow down hill, which is a back-breaking and very tiring job. I’ve now extended it to the flat area and have had to create a hidden path through because it’s so large I cannot get into the centre without standing on anything. I’m now wondering whether to remove some of the border from the side, as one edge is totally straight and looks out of place with the rest of the garden. The cherry border exploded in 2012 thanks to all the rain and the light it now receives after the removal of the Summer house in 2011. Geraniums were over waist-height, Foxgloves were enormous and Primula leaves larger than my brother’s size 13 feet. I’m unsure whether to thin and divide the Geraniums or assume it’s only so massive due to the rain and can assume in coming years it will not be so gargantuan. For perhaps the first time the Buddleja border was a success! Mostly thanks to the Geranium Thurstonianum making a bid to take over the world, but also the Astrantias very much appreciated the rain, and the addition of a few Lupins and Salvia helped to bring more interest to the area. 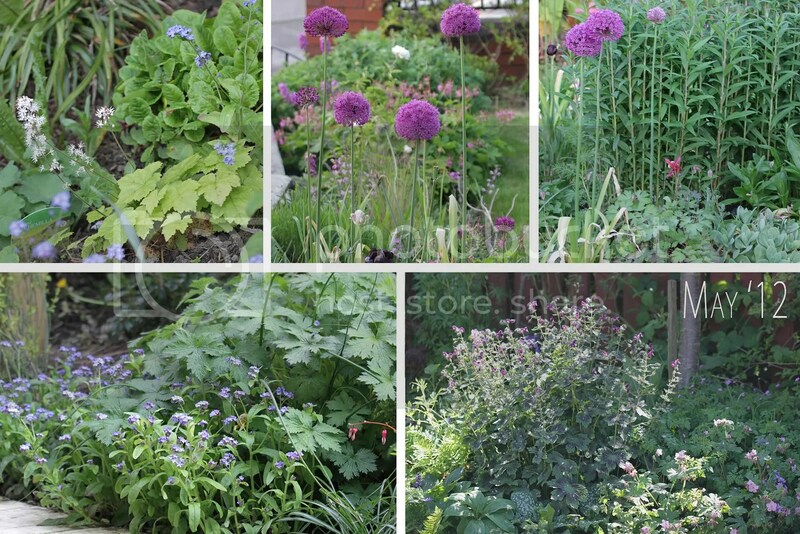 Generally I left the upper tier alone, adding only a few plants such as Anemone, Coreopsis and Aster. Of course I also added David Austin ‘Gertrude Jekyll’ and Clematis Etoille Violette on the fence. The front garden also looked very nice, after the near completion of the path border leading to the house, and a much more interesting front window border the garden is beginning to look quite nice. I bought a couple of Pyracantha that are intended to replace a large shrub rose once they have grown and will not look too out of place. I want them to create a small hedge along the wall to provide nest sites and berries for birds. Adding more grasses to the front of the right border; I could move grasses from the Aster border and swap them with the plants in the right border.